The fat content of all ice creams in this category is low and of vegetable origin. The ice cream is also free of added sucrose and its sweetness is derived from Maltitol, a bulk sweetener, and an intensive sweetener, Stevia. Maltitol is a polyol derived from Malt and it’s friendly to teeth and suitable for diabetics, and obesity. Contrary to the common sugar, it is a low glycemic response product, and therefore gives a satisfactory metabolic balance. As a consequence, its consumption does not lead to an increase in blood glucose level and stimulates a very low level of insulin production in the blood. Stevia is about 100 to 300 times sweeter than sugar, but has no carbohydrates, calories or artificial ingredients. Due to the presence of polyols, excessive consumption may induce laxative effects. 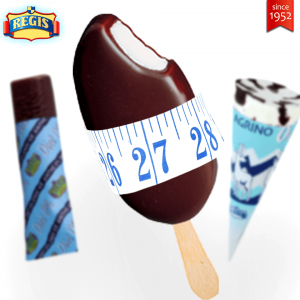 The classic Choc Ice with dark chocolate coating with no sugar and reduced calories. A light ice cream in cone garnished with chocolate syrup with no sugar. A vanilla ice cream stick with chocolate coating and no sugar. A refreshing ice cream in 190ml tub containing two delicious flavours. Ice cream in 190ml and 125 ml tubs containing Vanilla & Chocolate or Vanilla & Strawberry ice cream. This family reduced calorie ice cream also has a very low fat content of 2.6 g per 100ml. Our largest family package with four flavours of reduced calorie ice cream. With a very low fat content of 2.6 g per 100ml. All ice creams listed above can be consumed by diabetics. See REGIS’ 0% sugar ice creams here. For your own better information regarding these products please see below a table with the average nutritional value for each ice cream.